Thyme tastes delicately green with a faint clove aftertaste, Leaves and sprigs are used in salads as garnishes and most famously in clam chowder, bouquets garnis, and French, Creole, and Cajun cuisines. Thyme works well with veal, lamb, beef, poultry, fish & poultry. 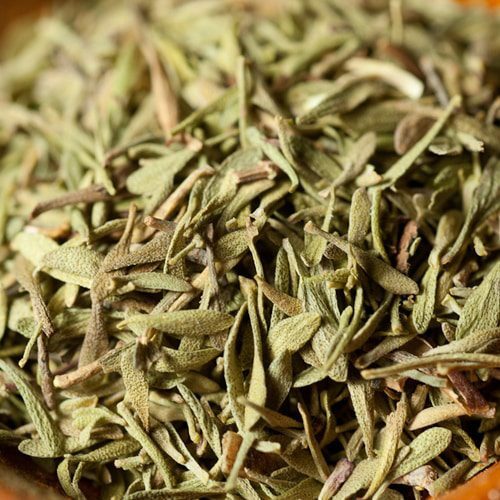 MEDICINAL: Thyme warms and stimulates the lungs, expels mucus, and relieves congestion. It also helps deter bacterial, fungal, and viral infections. Both constituents thymol and carvacrol have a relaxing effect upon the gastrointestinal tract's smooth muscles.